See ANZAL products and services in action - with our library of Case Studies. A new kitchen in Queenstown provides students and tutors with the perfect training environment. In the high-volume cabinetry market, panel products need to be fit for purpose, easy to cut, and easy to store. 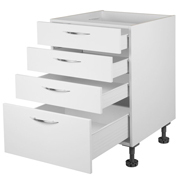 Our light-weight PanelWhite is an economical board specifically for cabinet backs, drawer bases, and more. 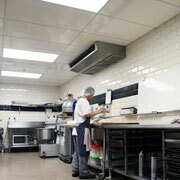 Cooking vapour requires commercial kitchen ceilings, above all, to be easy to clean and maintain. 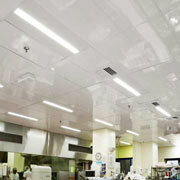 Waikato Hospital has replaced its kitchen ceiling with the high-gloss Fenta Ceiling Tile for its maintenance benefits. 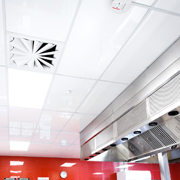 Choosing the right ceiling tiles for commercial food prep areas is the difference between a maintenance nightmare and a maintenance dream.